LASTCAR.info will be making a few changes this season, including “Entry List Storylines,” which returns this Friday with a new format. The biggest change will be to “Throwback Thursday,” which will end this July in order to allow more time to promote my new book, J.D. : The Life and Death of a Forgotten NASCAR Legend. From now until the July 15 release, the segment will move to Wednesdays, and will focus on McDuffie’s career at each track on the Monster Energy NASCAR Cup Series circuit, both past and present. Included will be pictures and information that didn’t quite make the cut into my book. Today’s feature will be one of the shortest, as it involves a race where McDuffie made just one start, but an important one nonetheless. It’s perhaps appropriate that this series starts with one of the biggest accomplishments of McDuffie’s career: making the inaugural running of what is now the Advance Auto Parts Clash at Daytona. Back then, the “Busch Clash of ’79,” as it was known, was invite-only, restricted to only the pole winners of the previous season. McDuffie’s lightning-quick lap at Dover the previous September made him the ninth and final driver to make the cut. Cale Yarborough, just coming off his third-consecutive Winston Cup, had scored a series-leading eight, including the last three poles in a row. 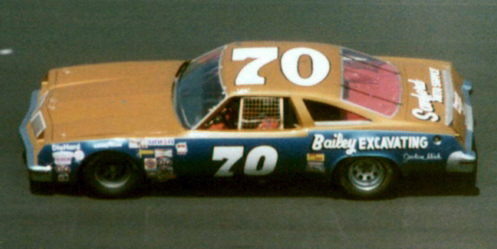 David Pearson’s Wood Brothers Mercury picked up another seven. Buddy Baker, who went on to dominate much of that SpeedWeeks, qualified by taking just one – 1978’s spring race at Dover. McDuffie always preferred racing Chevrolets, but this time around, crew chief Jimmy Byrd prepared him an Oldsmobile, which at the time had become the go-to car for many teams on superspeedways. The car would also run Goodyear tires – the McCreary tires he ran at Dover the previous year weren’t strong enough to run at Daytona. In fact, they weren’t really meant for Dover, either, and fell apart so quickly that it contributed to his disappointing 33rd-place finish. Qualifying wouldn’t be an issue for The Clash, as the nine competitors drew for position by reaching into an ice bucket for numbered cans of Busch Beer. He drew the fifth spot. The first iteration of the Clash was a literal sprint race – just twenty laps with the winner earning $50,000. Unfortunately, McDuffie never contended. He slipped out of the inside line before the leaders entered Turn 1, and had lost touch with the draft down the backstretch. He ended up pulling off the track with three laps to go. Though citing engine trouble, the true culprit had been a burned-out bearing. That day, McDuffie became the first driver ever to fail to finish the Busch Clash. It remains the only time car #70 has ever started the event (including this year). But he took home $10,000 for his effort, nearly twice as much money he’d earned from any one race the previous season. He’d earn another $4,470 the following week, when he finished 25th in the Daytona 500.